It’s a busy day at work. People have been coming at you from every direction with ideas, suggestions, problems, and needs. The phone is ringing off the hook and finally it’s time to wrap up the hectic day and head home, only to be greeted by chaos. Dinner, laundry, homework, and baths are just the start of the chores list to be completed before bedtime. If this sounds like a day out of your playbook, you know all too well the stresses and strains that many of us face each day. It’s no surprise that we’re looking for some solace and peace to calm our anxious lives. Hence the arrival of adult coloring books to the market. The popularity of adult coloring books is playing a huge role in marketing decisions and product development for major companies, but why are adults getting on the bandwagon? As children we all remember drawing time or art time in school. Dating back to preschool or early childhood development, we loved picking up the multitude of Crayola colors that lined the art bucket and coloring in the array of lines to suit our own imaginations. The liberty to choose our own color combinations and make a project come to life made coloring such a fun experience. Art therapy is what this is commonly referred to in the medical world. 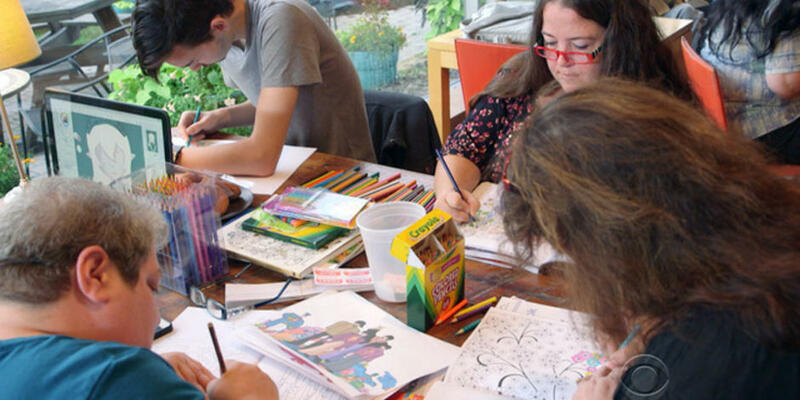 Art therapy can go into a deeper meaning, but for those who are new to the coloring book craze, it’s a way to relieve stress, be calm, and become “mindless” for a period of time. According to Johanna Basford, Amazon’s top adult coloring book author, “it’s less daunting and intimidating” than a blank sheet of paper. “Chances are the last time you spent some time colouring you didn’t have a mortgage, a horrible boss, or worries about climate change,” Basford says on Gizmodo.com. According to a December Forbes magazine article, adult coloring books are one of the biggest contributors to this year’s boost in print-book sales. With over 11,000 search results total, five of Amazon’s current top 15 best-selling books are coloring books. In an Adobe 2012 State of Create Study, it was determined that unlocking creative potential is seen as key to economic and societal growth, but only one in four adults is living up to their creative potential. That leads us to conclude that there is a big gap between those who feel they have time to be creative and those that who are currently being creative. “It is when there are problems in life that are blocking me from doing certain things, and I have to find a creative way to overcome these obstacles,” says a participant in the Adobe study about why coloring books are appealing. Creativity has been linked to how we handle ourselves in stressful or “stuck” situations. With practice in building our creativity, we are helping to expand our ability to think on our feet, have an open mind, and build upon real life experiences for a solution. If we are living in a society where everyone is giving us the answer, then we become dead. We lose the choice to make our own choices. Our brain’s prefrontal cortex is responsible for coordinating thousands of decisions that we make each day. These decisions can be as superficial as the type of clothes we wear to complex life altering decisions. It believed that giving our prefrontal cortex a break from decision fatigue by taking time to make simple, inconsequential decisions — like picking a color — can offer a fresh dose of self-control after a long day of important decision-making. Sure, there are plenty of beautiful artistic designs that are appearing on social media from your friends, but there’s not a color code for any drawing. It’s liberating to build your own design and imagination on a blank drawing. Don’t get discouraged if it doesn’t live up to others you’ve seen; the practice of simply choosing colors and filling in the blanks is good enough to get the job done. If you do want some suggestions and guidance, a color wheel is a good place to start. Some elaborate drawings can take hours, days, or even weeks to complete. If you’re more advanced and want to build on color blending combinations or smudge techniques, a color wheel is a good place to start. Sometimes the kids need a break, too. To make coloring a family affair, simple allocate a few minutes after dinner or for a homework break when everyone in the house grabs a crayon or coloring pencil and a coloring book. Set a timer and stick to it. Everyone can enjoy a quick retreat for a color break and then back into your tasks you go! Have fun! This exercise for stress relief isn’t about perfection. If you can’t make time each day, that’s fine. It’s like grabbing your favorite book. Take a few minutes, de-stress, and then go on to things you need to do. 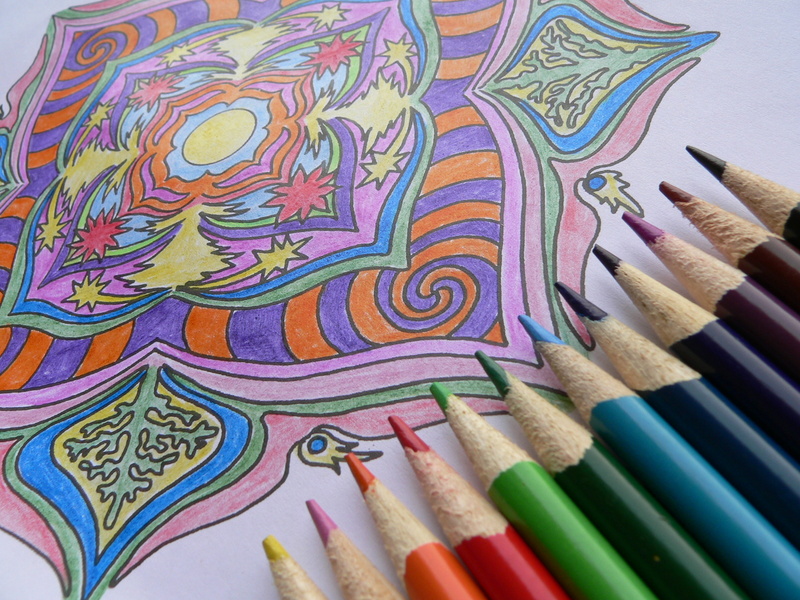 Enjoy yourself and make coloring a fun and relaxing experience!